Soerens is a co-author of the book Seeking Refuge and the US Director of Church Mobilization for World Relief, a branch of the National Association of Evangelicals. World Relief began after World War II in response to the humanitarian crisis in Europe. With the topic of refugees increasingly in the news, Soerens says he reflects on Chapter 5 of the New Testament Gospel of Matthew. This is where Jesus tells his followers to let their light shine before others so that people will see their good deeds and, as a result, praise the Father in heaven. Listen to our 19-minute conversation by clicking on the LISTEN or DOWNLOAD icon above. 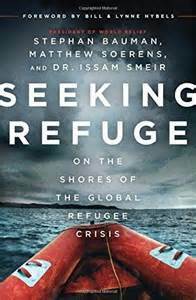 Learn about the book Seeking Refuge, by Stephan Bauman, Matthew Soerens, and Issam Smeir.